New members are welcome to join the Space City Pinball League at any time. 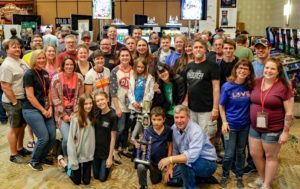 To join, all you need to do is show up and play in any Space City Pinball League event. The league primarily uses our Facebook group to communicate news and events. Visit facebook.com/groups/spacecitypinball/ to request membership. We highly recommend that all members subscribe to the email list using the form below. We will periodically send emails regarding upcoming events, event results, and general announcements. You can unsubscribe or change your email settings at any time.